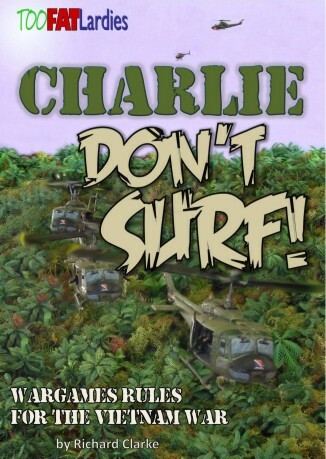 Charlie Don’t Surf, the new company-level Vietnam rules from Too Fat Lardies, arrived on my doormat with a “Thump!” this morning. As you know, I’ve been pretty excited about these rules coming out, and I have to say that they are well worth the wait. I had a sneak preview when the PDF arrived in my email inbox late on Thursday night, but I have to say that I’m very pleased to have ordered the hardcopy as well, as it’s a very well produced book. Some people may rue the lack of colour in the book, but let’s not get distracted by minor issues here – the rulebook is a very nice publication. Clear, concise and well laid out. As for the rules…it’s designed to be played in a scale between 6mm and 20mm, with the smallest unit being the squad. Whether you represent this by a group of individual models or by a base of troops is up to the player, but bear in mind that you do have to track removal of casualties. Gameplay, as with most (if not all) TFL games is card driven, with emphasis being given to the ‘Big Men’ on the battlefield who step up take control of situations. The game looks to comprehensively cover all aspects of the war, with the possible exception of riverine operations (stats are given for river craft, but the game itself seems to concentrate more on ground operations) and has some interesting aspects – including the fact that scenarios have both military and political victory conditions. The only disappointment so far is the mission/scenario generator. It isn’t quite as comprehensive as I would like, and leaves things like determining the mission objectives up to the players – it’s only a minor grumble, and I own enough other Vietnam rules that this can be covered elsewhere, but it’s an area that could be improved. However, after a first read through of these rules I am very much looking forward to getting them onto the table – and of course I will be recording an in-depth review of them on the podcast in due course. In the mean time, I am left to decide what scale to play these in. Due to the cost, I’m looking at gaming these in micro-scale. I was originally going to try these in 1/600 scale, but that seems to be a little too small. 6mm would seem logical, as it’s a scale I’m familiar with, even though I believe that there is only a single manufacturer that produces figures for the period (GHQ). The other possibility is 10mm, with Pendraken and Miniature Figurines both producing models in this scale. The price of these two scales is remarkably similar, with the only real difference being in the price of the ground vehicles – I’d be interested to know people’s thoughts on the relative merits of these figure ranges. I have both MF and PD figs for Nam. The MF tend to be finer figures and the PD more rugged. Personally I prefer the PD figs, but am the other way round with vehicles. Have them for CWC, and am now going to go with them for CDS. I also have both Minifigs and Pendraken for CWC. I tend to mix and match figures as once they are painted both work well. I prefer the Minifigs VC and their vehicles. Nigel Pell at The Square told me that he has a range of 10mm figs – I think they were from Bren Gun Miniatures – to be made available soon. I’ve not seen the figures yet so don’t know how they may fit in.